I think we all know that vertical is better. We’re treating our bodies better when we’re standing up or moving. And people who use standing desks report better breathing and fewer back troubles.And a vertical mouse may be be the recipe for reduced hand and muscle strain. 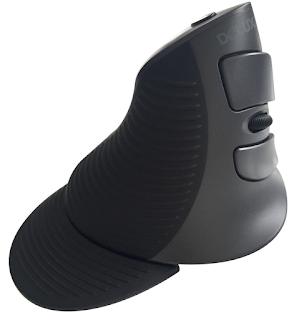 The Delux Ergonomic Mouse is featured No More Pain Ergonomics, an Australia-based website stocked with products that contribute to a healthier lifestyle and workstyle. The mouse has a unique vertical design that starts with a wrist rest feature that helps reduce unnecessary wrist rubbing on the surface of your desk when you operate the mouse. It also has two short-cut buttons and a scroll control for smooth browsing. The mouse sells for about $60 at the No More Pain Ergonomics website. While you’re there, check out the site’s other ergonomic products including keyboards, a footrest, forearm support and risers for laptops and monitors. You can also follow the mouse @ergonomic_mouse on Twitter.